When we speak of traditional grassroot activism, it has its foundations in academic theory that can be linked to modern social media activism today. One of the world’s topmost intellectual, Noam Chomsky, in his revolutionary essay, ‘The Responsibility of Intellectuals’ writes that ‘intellectuals are in a position to expose the lies of the government’, to ‘analyse action according to their causes’ and ‘motives’ and often ‘hidden intentions’. For propagation of rightful ideas, he even choses ‘three types of intellectual traditions’, namely ‘area specialists’, ‘social theory’ with emphasis on the ‘theories of international system’, ‘social change’, ‘conflict resolutions’, and the ‘analysis of public policy’. These ideas were eventually implemented by Chomsky, as a reaction against the consequences of Vietnam war, dumped by mainstream press during those years. However, even today, these ideas have once more incarnated revolutions that happened in Tunisia, Egypt and Yemen during the Apring Spring. These ideas mentioned by Chomsky can also serve as a pivotal constitution for anarchist voices in our vale, especially youth who want inspiring ideas of a liberated society. 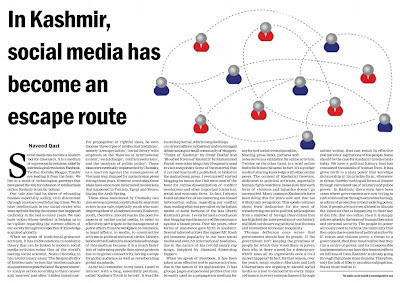 Kashmiri youth, therefore, should realise the positive aspects of online social media, in order to effectively participate in the management of public affairs, from the workplace, to commerce, to legal affairs, to media, to constructive activism in political and social circles. I always believed that Kashmiris should take advantage of this medium because it is a much faster way of informing people than constructive street protests due to its global connectivity, having a scope for global audience as well as reverberating global standards. As far as I remember, in my teens, I used to interact politics on a blog called ‘Kashmir Truth To be Told’. 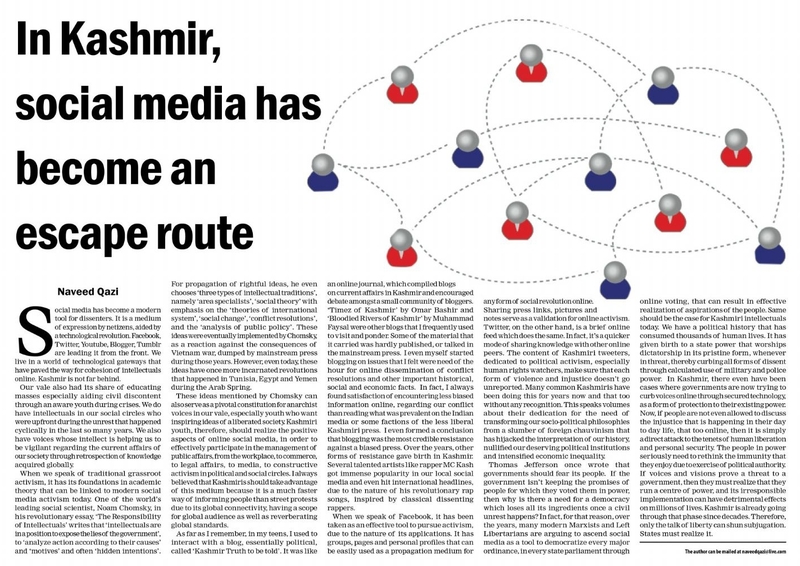 It was like an online journal, which compiled blogs on current affairs in Kashmir and encouraged debate amongst a small community of bloggers. ‘Timez of Kashmir’ by Omar Bashir and ‘Bloodied Rivers of Kashmir’ by Muhammad Faysal were other blogs that I frequently used to visit and ponder . Some of the material that it carried was hardly published, or talked in the mainstream press. I even myself started blogging on issues that I felt were need of the hour for online dissemination of conflict resolutions and other important historical, social and economic facts. Infact, I always found satisfaction in encountering less biased information online, regarding our conflict than reading what was prevalent on the Indian media or some factions of the less liberal Kashmiri press . I even formed a conclusion that blogging was the most credible resistance against a biased press. Over the years, other forms of resistance gave birth in Kashmir. Several talented artists like MC Kash got immense popularity in our local social media and even hit international headlines, due to the nature of his revolutionary rap songs, inspired by classical dissenting rappers. When we speak of Facebook, it has been taken as an effective tool to pursue activism, due the nature of its applications. It has groups, pages and personal profiles that can be easily used as a propagation medium for any form of social revolution online. Sharing press links, pictures and notes serve as a validation for online activism. Twitter, on the other hand, is a brief online feed which does the same. Infact, it’s a quicker mode of sharing knowledge with other online peers . The content of Kashmiri tweeters, dedicated to political activism, especially human rights watchers, make sure that each form of violence and injustice doesn’t go unreported. Many common Kashmiris have been doing this for years now, and that too without any recognition. This speaks volumes about their dedication for the need of transforming our socio-political philosophies from a slumber of foreign chauvinism, that has hijacked the interpretation of our history, nullified our deserving political institutions and intensified economic inequality. Thomas Jefferson once wrote that governments should fear its people. If the government isn’t keeping the promises of people for which they voted them in power, then why is there a need for a democracy which loses all its ingredients once a civil unrest happens? Infact, for that reason, over the years, many modern Marxists and Left Libertarians are arguing to ascend social media as a tool to democratise every major ordinance, in every state parliament through online voting, that can result in effective realisation of aspirations of the people. Same should be the case for Kashmiri intellectuals today. We have a political history that has consumed thousands of human lives. It has given birth to a state power that worships dictatorship in its pristine form, whenever in threat, thereby curbing all forms of dissent through calculated use of military and police power. In Kashmir, there even have been cases where governments are now trying to curb voices online through secured technology, as a form of protection to their existing power. Now, if people are not even allowed to discuss the injustice that is happening in their day to day life, that too online, then it is simply a direct attack to the tenets of human liberation and personal security. The people in power seriously need to rethink the immunity that they enjoy due to exercise of political authority. If voices and visions prove a threat to a government, then they must realise that they run a centre of power, and it’s irresponsible implementation can have detrimental effects on millions of lives. Kashmir is already going through that phase since decades. Therefore, only the talk of liberty can shun subjugation. States must realise it.